Skull is a game that is almost entirely dependent on group composition. With a good group, it’s a lot of fun – that’s why we gave it three and a half stars. With a bad group, it’s a slightly more interactive version of watching paint dry. Many games are improved, or otherwise, by the people playing. Skull is one of the rarer games that will live or die on that basis. As such, it’s important that the widest range of people possible can play. Can they? Let’s find out! The nature of the game is that colour doesn’t matter. There are clashing palettes, but there are also distinctive visual designs that make everything uniquely identifiable. Nicely differentiated, even if it doesn’t actually matter. But really, this is a game that would work just as well in monochrome. 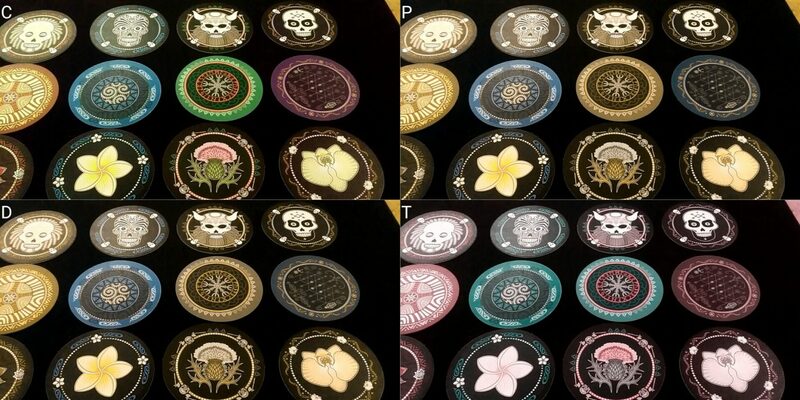 You place discs face down in front of you, and they have either a skull or a rose on their obverse. The expressive art-work here adds considerably to the atmosphere of the game, but it’s entirely ornamental. Ascertaining ownership and the symbols on the faces of the discs is the only information you need in order to play. You can always tell which skull is yours. Just feel your head. As such, we strongly recommend Skull for those with all categories of colour blindness, including monochromacy. The only information that a player needs to be able to visually ascertain is what’s on the discs in front of them. 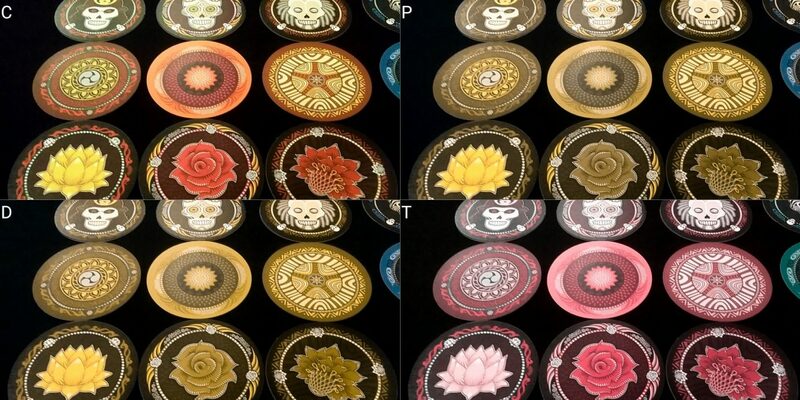 There are no tactile identifiers for this, but the symbols are very large, and it’s very difficult to become confused as to whether you’re looking at a rose or a skull. If you can make out these symbols, you can play. If you have any ability to visually discriminate at all, I suspect you could play this with no real difficulty. In circumstances of total blindness, there are even modifications that would be possible, much in the same way one might mark a deck of cards. A notch in the eyes of the skull for example would allow someone to differentiate by touch. When it comes to selecting cards as part of a challenge, all you need to know is what you selected when you picked a player, and the group will let you know what that is, even if they don’t mean to. They’ll laugh, or cheer, or whatever. It’s all a natural part of play. All you as a player need to do is indicate which stack you want to flip over, because it’s always the top one that is flipped first. You’d need to remember, or be reminded, as to how many discs each player has, but that’s unlikely to be a serious burden in play. Simply adopting a convention of the group chanting out what was revealed will alleviate almost all of the visual accessibility issues that would come from keeping track of gameplay. As such, we strongly recommend Skull in this category. Skull is a game of reading others, and attempting to lay traps. I’ve remarked before in other teardowns though that I think we tend to give ourselves too much credit for success in these kind of games. While especially good players will almost certainly do better than those relying on random guesswork, it’s unlikely to be much better. It’ll be observable, on a statistical level, over the long term but consistency cannot be guaranteed, or even reasonably assumed. As such, while the game of Skull implies a degree of social awareness and cognitive flexibility, it can also be enjoyed as a simple guessing game. As such, the only real cognitive cost of play is understanding the rules, and remembering whether you placed a skull or a rose on your mat. For the latter, you can always check to see – it might signal game information, but it might also be part of a bluff. There are no game synergies, no conditional complexity, no awkward scoring requirements, and no need for literacy or numeracy. We strongly recommend Skull in this category. 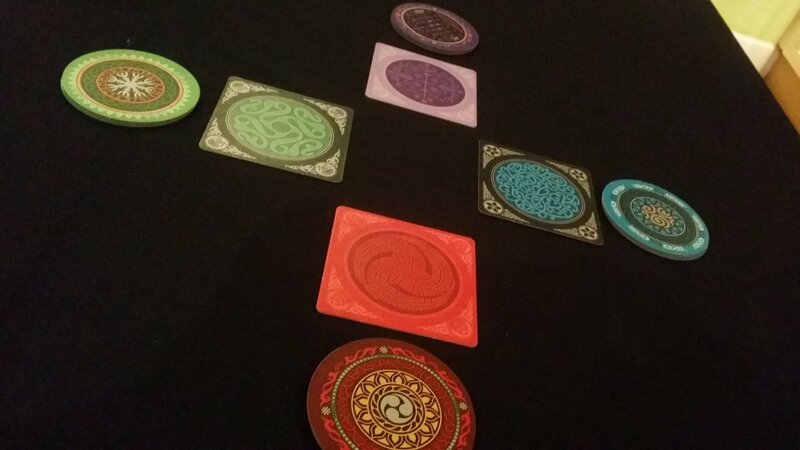 Bluffing games can create some issues with regards to emotional accessibility. As discussed above in the section on cognitive accessibility, you can play it as a guessing game rather than as a game of reading other players. However, you do benefit from the ability to pick up on social cues, and you gain considerable advantage from being able to avoid revealing information through tells or nervous behaviour. You don’t have to lie, as such – the game isn’t about convincing people through communication, it’s about letting them convince themselves. Playing well though is going to involve ensuring you don’t make that job easier than it would otherwise be. The game doesn’t have player elimination, but it does have elimination of effectiveness. If you lose your skull, the emphasis must shift on to more concentrated bluffing with an element of acting. You need to pretend that you haven’t just been declawed. This naturally involves a degree of artifice. You can’t just plop your cards down without looking at them – even though it doesn’t matter, that’ll signal you don’t have skulls to play. Likewise you can’t ham it up, making an ostentatious display of humming and hawing over your selection. That too will indicate you don’t have a skull to spend, because it’s over-elaborated. Except, neither of those things are necessarily true – they could in themselves be a ruse to make people think you’re not going to be able to cause them problems. Pulling that off can be tremendously effective, but it also requires, again, an ability to read social cues and act on them. Not just in terms of placing your traps, but in terms of being able to tell when other players are behaving suspiciously. With random guessing, you’re probably not going to reliably succeed but at least you didn’t fall for a trap. If you are trying to read people and it turns out you’re wrong, then they managed to fool you. It’s a direct social challenge that not everyone is well equipped to meet. If playing in a mixed ability group, this is likely to be highly problematic. If most people can pick up on facial expressions, eye gaze, and signaling cues then it’s to the extreme disadvantage of those players that can’t. We’ll offer a tentative recommendation for Skull in this category, but we’d advise careful consideration of the discussion above before adopting it in your group. The largest element of the game is mental – it’s in working out which of the discs you’re going to manipulate. The actual physical act itself is not onerous – if you have movement in your hands and arms, and can reach over a table, you wouldn’t have a problem playing. Verbalisation is possible too if physical interaction is not an option. Since stacks are flipped from the top down, all you need to do is indicate which player is to turn over their topmost disc. When playing your own cards, you can indicate which is to be placed and another player can place it on the mat for you. 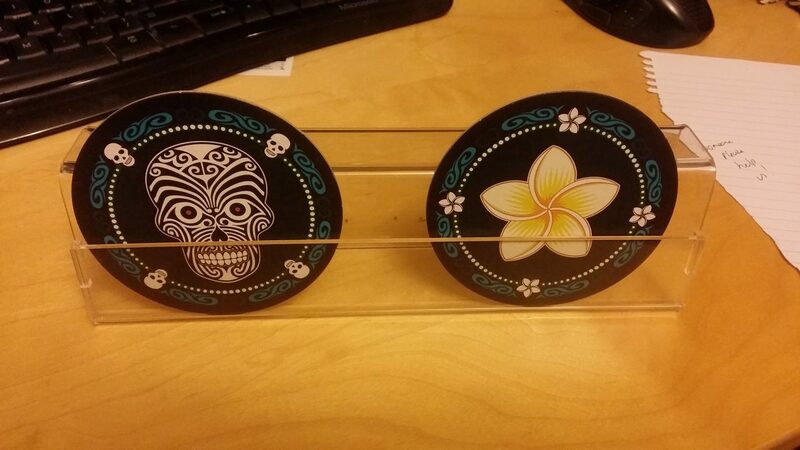 The cards are circular, which is awkward, but they will likely work with a pair of card holders. There’s no need for physical manipulation of the cards you’re holding, other than to keep them hidden from other players. When someone hits your skull, you are supposed to claim a random disc from their hand. However, you can instead have them discard one at random, or have them spread out in front for you to indicate verbally. All of this leads to a strong recommendation for Skull in this category. The game requires no reading, and no direct communication. However, it does benefit considerably if everyone playing has an ability to deal effectively with social cues. It is in the end a game of social deduction. This is an issue more in terms of emotional accessibility than in terms of communication, but one worth reiterating. We recommend Skull in this category. The aesthetic of the game is perhaps a little too ‘metal’ for it to be suitable for young children, or for those with a sensitive disposition. It doesn’t strike me as something likely to cause any upset though unless one of is of an especially critical bent of mind. If you fear the satanic imagery in things like Dungeons and Dragons, you might want to play skull instead with a pack of playing cards. Cost wise, the game is a bargain – it has an RRP of £15 and supports as many as six players for that. 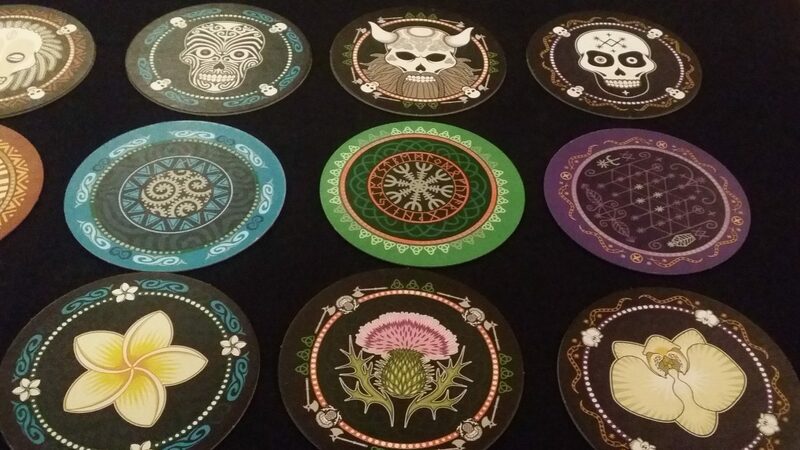 You can make your own version though with nothing more than a few beer mats and a felt pen, or a pack of cards. It might be a little difficult to justify the purchase if money is tight. The production values though are excellent, and I think it is worth every penny. Games of Skull are very quick, and require little direct intervention on the part of anyone playing. If someone needs to drop out before the game is won, it doesn’t have much game impact provided there are enough players left to carry on. Skull has a floor of three players, but it is best played with more. Three players will be enough to see it through to a conclusion though. Other than that, there are no intersectional issues to consider. Even the use of hidden hands isn’t an intersectional issue because there is no complexity to the cards, and the visual design is so striking that it should be readable and comprehensible to those with visual and cognitive impairments. 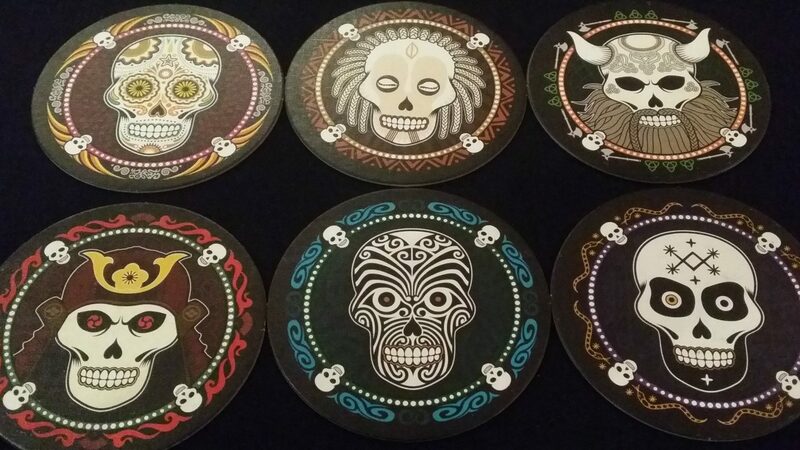 Skull is an extremely accessible game – the most accessible we’ve encountered yet on Meeple Like Us. It narrowly pips Lanterns to that title, although since it is a game that has many fewer mechanics it’s not exactly a fair comparison. It’s interesting to see here the disparity between Dobble and Skull. Dobble is a game which is ostensibly simpler than Skull, and yet fundamentally inaccessible to large groups of players. Skull is slightly more complicated, and yet broadly accessible across all categories of impairment. They’re both card games, both party games, and both shorn of any extraneous mechanics. And yet they couldn’t be more different in terms of their accessibility profiles. I’m often surprised at the way games come out of these teardowns. My gut feeling on a game is often at odds with what a proper, focused analysis reveals. My initial feeling was that Dobble and Skull would fall roughly within the same ballpark. It turns out they’re barely even playing the same sport. Every day is a school day, and this is part of the reason why I enjoy the work I’m doing on Meeple Like Us so much.